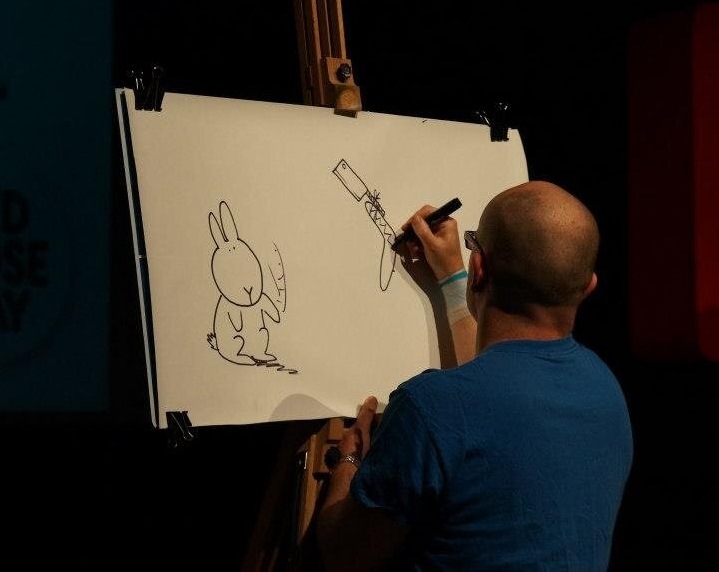 This morning I did my first live appearance of the year… Some onstage cartooning for Mark Watson’s 25 hour comedy marathon in aid of Comic Relief. If you haven’t heard of this – Mark is a comedian who invented a new genre of stand-up a few years back: endurance comedy. Over the years he has done several shows which were 24 hours long. A one-hour comedy performance is knackering enough. This, his longest ever at 25 (in honour of the 25 years which red nose Day has been going for) will apparently be his last marathon gig. As I write this, he is more than halfway to the end, but he’s still got 10 hours to go. And the great thing is, the whole thing is streaming live here: http://www.rednoseday.com/whats-going-on/mark-watsons-25-hour-comedy-marathon . There are lots of ways to give money to comic relief, but the easiest today has to be sending a text to 70005 with just the single word “MARK”. You will automatically donate five pounds. The other reason I’m telling you all this is that all the pictures I drove over the 45 min or so I was on stage will be up for auction! I’m not completely sure how they’re going to do it, but if you follow the hash tag #25hours on twitter, they will probably tell you at some point. Failing that the web address I gave in the last paragraph should have some info. perhaps inevitably, all the drawings are bunny suicides. There’s lots of other things I could draw, but you know how bands normally play their biggest hits at charity gigs? I suppose cartoonists are like that too. As soon as I learn precisely how you can get hold of these I will tell you here. Every penny will go to Comic Relief.